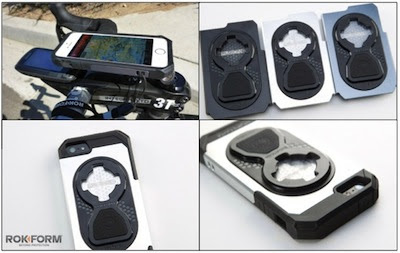 SANTA ANA, Calif. (April 28, 2014) – Rokform®, a leading manufacturer of smartphone and tablet cases and mounting systems, announced today the launch of the Fuzion+ RMS (Rokform Mounting System) as an enhancement to the innovative style and function of the Fuzion+ aluminum iPhone 5/5s case. The Fuzion+ RMS is an aircraft grade aluminum outer skeleton that provides protection, while the integrated back plate expands the mounting options, enabling the lightweight case to be mounted to all existing Rokform v.3 accessories – Bicycle Mounts, Motorcycle Mounts and Sport Clip, to name a few. Providing six different sides of protection and further complementing the aluminum outer shell is a high-impact thermoplastic urethane (TPU) inner body. In addition to the various Rokform v.3-mounting options, an integrated magnet enables a secure connection to the included TPU car magnet mount and any other ferrous metal object. A special inlet on the side of the case enables the Rokform lanyard to be easily attached, ensuring an additional layer of security while out on a ride. Now available for the iPhone 5/5s, the Fuzion+ RMS comes in three stylish finishes – raw aluminum, gunmetal and matte black. As with virtually all Rokform products, the Fuzion+ RMS case is designed, engineered and machined here in the U.S.A., and through extensive research and development, results in no signal degradation, regardless of service provider. Installation is quick and easy with no tools required. Be sure to stay tuned to the Rokform.com website and keep up-to-date on the latest protection and accessories by visiting Rokform’s social media pages. “Like” Rokform on Facebook, join the @Rokform conversation on Twitter, share you favorite #beyondprotection photo on Instagram, or subscribe to the Rokform blog and newsletter for exclusive promotions.